October 13th Signs, originally uploaded by indiaeden. 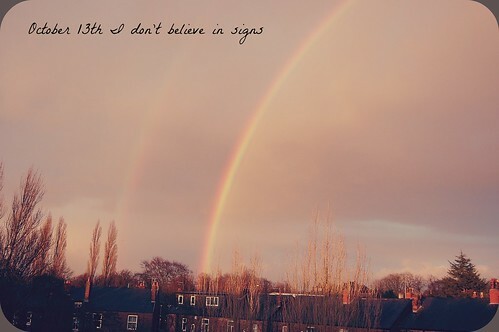 I don't believe in signs, that doesn't mean I don't say hello to rainbows, I do. When the sun streams into my window in the morning, I close my eyes and whisper a good morning. I don't believe in signs, but I am in awe of the universe and all it contains, and I do believe we are all part of that. I've said before that I think of Florence's body as nourishing the earth and becoming part, a teeny tiny part of the universe, the tiniest hint of each molecule of cloud and rain and sun, and earth. I don't believe in signs, but I still say hello to rainbows because it eases my heart for a few moments. Some would say fickle lol I think you are a sweatheart. "...not a bit of you is gone; you're just less orderly..."
yes, I like that explanation too. Oh, I love that Aaron Freeman piece. Thank you so much for posting it. It has me sobbing in my kitchen, but it is so beautiful. Peace to you and your lovely family.